Attacks in Paris show how urban security challenges are becoming more complex. They ask difficult questions and present no easy answers. 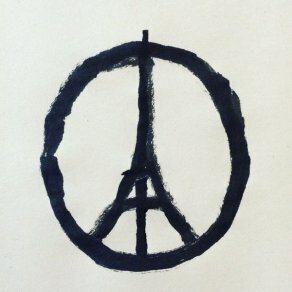 Peace for Paris by Jean Julien. Friday’s attacks in Paris were an alarming reminder of the threats of organised violence in European cities. This comes less than a year after the assault against French satirical magazine Charlie Hebdo, and days after similar attacks in Beirut, in Lebanon, and Sinai, in Egypt. The coordinated events in the French capital were quickly linked with islamic terrorist groups, with ISIS on Saturday claiming responsibility. In response, the French President Francois Hollande declared a state of emergency, implemented curfews in Paris, and took the unprecedented step of closing French borders. Balancing outrage and agony, Hollande promised the response against those responsible to be ‘remorseless’. In contextualising these events, two important issues should be emphasised. Firstly, cities across the world are facing new kinds of more complex security challenges. In Europe, cities embody the democratic values we hold, and are symbols of history and progress. Yet despite – or even because of – this they are also the places where protest, riots are large scale attacks are most likely to occur. Problems of social exclusion and radicalisation are also becoming more visceral, and cities are increasingly vulnerable to violent extremism and other forms of unrest. Furthermore, urban areas provide anonymity for individuals or groups, and are increasingly connected to global and transnational influences – both good and bad. This transnational dimension explicitly ties to the ongoing refugee crisis in Europe. Trumpeted in rolling news coverage, the events in Paris were quickly – and without confirmation – linked to the influx of migrants from Syria, Iraq and North Africa into the EU. Conclusions were drawn claiming that ISIS or other militant groups in the Middle East were using the refugee flows as cover for radicalised individuals to enter Europe. Yet while a concern, these types of blanket assertions of this kind about refugee populations are damaging and divisive, and it is important to remember it is precisely these types of attacks that refugees are trying to escape. Yet rightly or wrongly, the refugee crisis is now framed not only as a social and economic challenge for the European continent, but also as a security threat to European cities. Secondly, the attacks show the increasing difficulty for civilian police forces to provide security in urban areas in times of acute crisis. In Paris, the army was called in to install order in the capital and support the police forces following the attacks. Similar events have been seen in recent years in Europe in Malmö, Paris and London, where national armies have been either deployed or on call to securitise major European cities. This greater cooperation between the police and military forces has also been seen in the United States. Recent urban riots in Ferguson and Baltimore explicitly used military forces or military-style operations in combatting urban riots. Also at home, Norwegian armed forces and police have been involved in several joint training exercises, and the army recognises that urban areas will be important in future operations. There are advantages to greater police-military cooperation, yet a number of challenges emerge. Excessive surveillance, harassment of minority groups, or extended powers of arbitrary arrest or detention can have clear negative consequences. Securitised or militarised societies may also encourage vigilantism or retaliatory attacks and he mobilisation of far-right groups. Therefore, while armed force support for civilian security provision may give a veneer of safety, it also poses the risk of securitising or militarising cities and legitimising actions that could encroach on democratic rights and civil liberties. The ramifications of the Paris attacks will be considerable, and extend beyond Europe’s borders. In the short term, a likely response is greater militarisation and securitisation of major European cities. This is likely to include either the explicit use of the military forces to patrol and keep order in cities, or the greater cooperation between police and military in operational planning and intelligence gathering. Security checks, restriction of mobility, and greater monitoring of cities and citizens will likely increase. It also poses challenges for managing the ongoing refugee crisis, with increased security checks likely leading to a slowdown or halt migrant processing and entry. European leaders and the European Project may also be challenged. German chancellor Angela Merkel encouraged the politically unpopular policy of Europe opening its doors to refugees. These attacks may further strengthen the backlash against her. For the EU itself, unilateral shuttering of borders – as France and also Hungary, Slovenia and Sweden have done – presents a concerning precedent that may further shake the EUs foundation following the Grexit debacle earlier this year. Outside of Europe, if links to ISIS are credible, it may mark a turning point for US or NATO intervention in the Syrian conflict. European countries face increasing levels of urban complexity, the enormous challenge of refugee integration, and the potential for greater police-military cooperation to provide security in their cities. Despite the desire to create order in the short term, governments must be mindful that securitising cities can also heighten tensions, and may undermine democratic rights, inclusiveness and integration. In responding to Paris, European governments must balance the imperative for safe, inclusive cities, while also ensuring that civil liberties for all citizens are protected.